Colm Wilkinson is the best. After watching Les Miserablés in theaters and listening to the Broadway soundtrack obsessively, I’ve been thinking a lot about Jean Valjean’s character transformation. After the bishop lies on Valjean’s behalf, gives him the church’s silver, and “buys his soul for God”, Valjean transforms his life: he becomes a mayor, does good deeds, and prays a lot. He is an “honest man” in every sense of the word– except he isn’t truthful. Because he has broken parole, he has to evade the law to avoid slavery and arrest. In order to become an honest man, Valjean has to be dishonest. But interestingly, the gatekeeper in this narrative, the bishop, also becomes a dishonest-honest man when he lies to protect Valjean. In this story of dishonest-honesty, what does it mean to be honest? While Valjean is the poster-boy for fairness, sincerity, and moral uprightness, he isn’t truthful, candid, and law-abiding. Likewise, the bishop, while generous and respectable, gives away silver that isn’t his and lies to the officers. To both the bishop and Valjean, honesty (and honor) must be purchased, not necessarily earned. This moral exchange mirrors the economic nature of honesty in Les Mis. It’s clear from the beginning that becoming an honest man, at least in 19th century France, requires money. As a slave, Valjean is dehumanized; he doesn’t have the means to do good deeds, go to church, or hold a job. Just as Valjean buys honesty, the bishop “[buys Valjean’s] soul for God”, a concept reminiscent of indulgence-buying. Souls are monetized; honesty is monetized. This monetization gives way to a moralization of classes, meaning that the poor are portrayed as less virtuous by default, and the rich are more virtuous. This kind of moralization of class is also seen in the English language– the word “vulgar”, which comes from the Greek word for “common or ordinary”, means “having a common and offensively mean character” (“vulgar”); “ignoble” doesn’t just mean “not noble with respect to birth”, but also “mean, base, sordid; dishonorable” (“ignoble”). In the Catholic culture in Les Mis, where souls and honesty must be purchased, this social hierarchy is upheld. The poor cannot afford to be honest, and especially can’t afford the luxury of being considered honest while lying– even if it’s for a good cause. In this way, Les Mis is a fascinating inquiry into the nature of honesty and the economics of honor. It seems like an odd lens through which to view Les Miz … Measuring the honesty of a fictitious work? Fiction is by definition untrue, and therefore on some level dishonest. That’s what Plato argued in ‘The Republic,’ if I recall. The moral focus of Les Mis reflects those of the times, namely the disparity of wealth and power that led to the French revolution. And the priest’s lie is compelling (if perhaps naively idealistic) because he forgives in a Christlike way, and believes in Valjean’s redemption and innate goodness as a human being. Fortunately, his faith is borne out in the novel. If Anne Frank is in the attic and the Nazis are at the door, I think it’s OK to lie. Apparently, Hugo felt that other moral virtues took precedence over honesty in these cases. 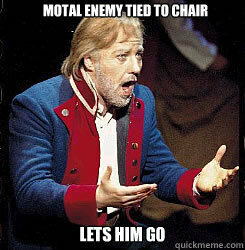 Given the popularity of Les Mis, a few others must agree. Les Miserables turns virtue on its head in multiple ways, which is part of what makes it fun to read. I totally agree. One of the reasons I love Les Miz so much is because it complicates morality in really interesting ways. I don’t think people need to be honest all the time in order to be good– especially in some cases, when it’s obviously more moral to lie. But I do think that the use of the phrase “honest man” is an interesting translation.